Coordonnateurs : Bergum G.E., Philippou Andreas N., Horadam Alwyn F.
This book contains thirty-three papers from among the thirty-eight papers presented at the Fourth International Conference on Fibonacci Numbers and Their Applications which was held at Wake Forest University, Winston-Salem, North Carolina from July 30 to August 3, 1990. These papers have been selected after a careful review by well known referees in the field, and they range from elementary number theory to probability and statistics. The Fibonacci numbers and recurrence relations are their unifying bond. 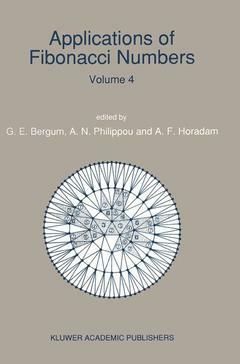 It is anticipated that this book, like its three predecessors, will be useful to research workers and graduate students interested in the Fibonacci numbers and their applications. March 1, 1991 The Editors Gerald E. Bergum South Dakota State University Brookings, South Dakota, U. S. A. Alwyn F. Horadam University of New England Armidale, N. S. W. , Australia Andreas N. Philippou Minister of Education Ministry of Education Nicosia, Cyprus xv THE ORGANIZING COMMITTEES LOCAL COMMITTEE INTERNATIONAL COMMITTEE Howard, Fred T. , Co-Chair Horadam, A. F. (Australia), Co-Chair Waddill, Marcellus E. , Co-Chair Philippou, A. N. (Cyprus), Co-Chair Hayashi, Elmer K. Ando, S. (Japan) Bergum, G. E. (U. S. A. ) Vaughan, Theresa Harrell, Deborah Bicknell-Johnson, M. B. (U. S. A. ) Campbell, Colin (Scotland) Filipponi, Piero (Italy) Kiss, P. (Hungary) Turner, J. C. (New Zealand) xvii LIST OF CONTRIBUTORS TO THE CONFERENCE *ALFORD, CECIL 0. , (coauthor Daniel C. Fielder) "Pascal's Triangle: Top Gun or Just One of the Gang?" *ANDERSON, PETER G. , "A Fibonacci-Based Pseudo-Random Number Generator. A Fibonacci-Based Pseudo-Random Number Generator.- On the Proof of GCD and LCM Equalities Concerning the Generalized Binomial and Multinomial Coefficients.- Supercube.- A Note on Fundamental Properties of Recurring Series.- Period Patterns of Certain Second-Order Linear Recurrences Modulo A Prime.- Nearly Isosceles Triangles Where the Vertex Angle Is a Multiple of the Base Angle.- The Ring of Fibonacci (Fibonacci “Numbers” With Matrix Subscript).- One-Relator Products of Cyclic Groups and Fibonacci-Like Sequences.- A Generalization of the Fibonacci Search.- Pascal’s Triangle: Top Gun or Just One of the Gang?.- Conversion of Fibonacci Identities into Hyperbolic Identities Valid for an Arbitrary Argument.- Derivative Sequences of Fibonacci and Lucas Polynomials.- A Carry Theorem for Rational Binomial Coefficients.- On Co-Related Sequences Involving Generalized Fibonacci Numbers.- Fibonacci and B-Adic Trees in Mosaic Graphs.- Fibonacci Representations of Graphs.- On the Sizes of Elements in the Complement of a Submonoid of Integers.- Genocchi Polynomials.- An Application of Zeckendorf’s Theorem.- A New Kind of Golden Triangle.- Terms Common to Two Sequences Satisfying the Same Linear Recurrence.- Recurrence Relations in Exponential Functions and in Damped Sinusoids and Their Applications in Electronics.- Some Basic Properties of the Fibonacci Line-Sequence.- De Moivre-Type Identities for the Tetrabonacci Numbers.- Two Generalizations of Gould’s Star of David Theorem.- On Triangular Lucas Numbers.- A Fast Algorithm of the Chinese Remainder Theorem and Its Application to Fibonacci Numbers.- Generating the Pythagorean Triples Via Simple Continued Fractions.- On the Moebius Knot Tree and Euclid’s Algorithm.- Generalized Fibonacci and Lucas Factorizations.- On Even Fibonacci Pseudoprimes.- Possible Restricted Periods of Certain Lucas Sequences Modulo P.- Using Matrix Techniques to Establish Properties of a Generalized Tribonacci Sequence.